GIBSONTON — At East Bay Raceway on opening night it was Tim Gay winning the Q Auto & Injury Attorneys Street Stocks, Ed Hill in the Limited Late Models, Michael Hart in the V8 Warriors, Keith Nosbisch in the Late Models and Dustin Cates in the Micro Sprints. In the Q Auto & Injury Attorneys Street Stocks it was the defending Champion Tim Gay picking up the win over Collin Kruse and Buck Woodhouse. In the Limited Late Models it was Ed Hill getting by Phillip Cobb with just a few laps to go with Forrest Gough coming in third. In the V8 Warriors in his first race moving up from the Motorstats.com 4 Cylinder Bombers, Michael Hart picked up the win with Roy Woodhouse second and Justin Meeks third. In the 30-lap Late Model feature Keith Nosbisch holding off hard charging Doug Horton who finished second with Bryan Bernhardt third. In the Micro Sprints Dustin Cates picked up the win holding off Dorsey Strickland and Matt Wedgewood third. Action continues next Saturday March 12th with the Late Models returning. Along with them will be the East Bay Sprints, Gagel’s Open Wheel Modifieds, Outlaw Fours, Mini Sprints and Florida Old Time Modifieds. 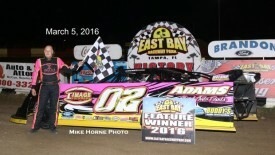 .For information, visit eastbayracewaypark.com or call 813-677-7223. 6. 22 Billy Howard, Jr.
7. 12 Jack Nosbisch, Jr.